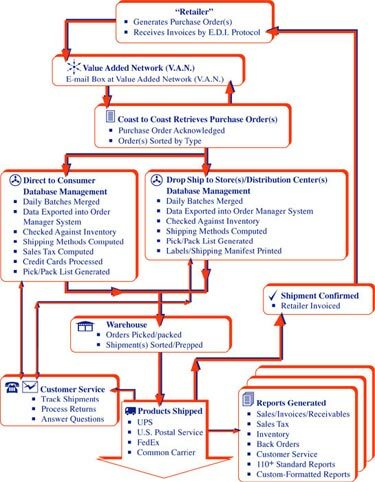 EDI Flowchart for B2B (Electronic Data Interchange) - Coast to Coast Fulfillment, Inc. Most major retailers issue purchase orders via E.D.I. (electronic data interchange). EDI is a structured system of computer-to-computer communication (non-Internet) for the transmission of purchase orders, acknowledgement of purchase orders, transmission of bills of lading, sending invoices, etc. It is the standard vendor-client communication medium for handling wholesale orders from all major retail chain store chains. Coast to Coast has over 25 years experience with all aspects of E.D.I. Compliance.